I am so excited to be writing this recap. March is over, which means April is here! April is hands down my favorite month of the year, and not because it’s my birthday month. The weather allows us to hopefully break out those shorts on a weekly basis, trees are turning green and the race schedule starts to ramp up! I usually dread March and feel like it is the longest time of the year, but this time it wasn’t so bad. I was crazy busy all month between work, working out and planning out the next couple of months. Let’s take a look at the numbers for March. Unnecessary purchases cut down: Well…. My running and racing went up a bit from March. Not only did I add more miles, but my pace got quicker and I even ran an adult PR in the 5k. I’m really excited that I’m able to get my times down again and hoping that this can continue into April. However, cycling went down hill this month, no pun intended. I need to get back on the bike, and maybe even get outdoors. Living 2 miles from downtown gives me the opportunity to bike to so many shops this summer, so I want to make sure I can handle it. I also added Yoga-lates to my schedule this month. I wasn’t sure I’d like it at first, but it gives me a great way to cross train, and to do some major stretching. I’m signing up again for another month of Om. Things that didn’t stay on track this month? My reading. I only read about 30 pages of my book, which is awful. I’ll be traveling in April, so I know I’ll get a chance to read more. I just don’t want sitting on a plane to be my only reading opportunity. I also spent a little more than I had anticipated this month. With a new season, comes new clothes, so I may have purchased a few new outfits perfect for spring. What else is perfect for spring? 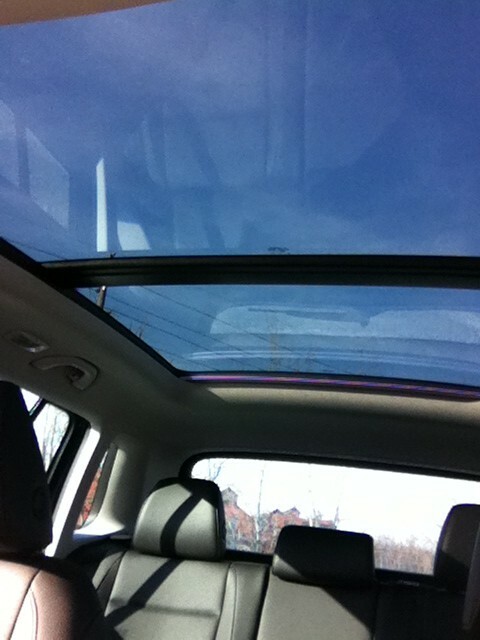 The giant sunroof in my new car! Let’s just call this an early birthday gift and continue to save money like my original plan. Sounds good to me! I’ve got a pretty laid back month coming up with an exciting vacation planned to Colorado. Funny, that’s also a birthday gift…. Happy April! And watch out for the jokers today!